Well it's another busy day in this house, as today is my eldest sons birthday - and today he turns into a teenager - it doesn't seem 13 years ago that he arrived. 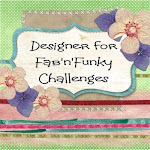 Being wednesday means that it is time for a new challenge over at Fab 'n' Funky, and this time we are asking you to use buttons and bows on your creations. Our sponsor this week is Pink Petticoat. It is also time for the new challenge at Penny's Paper Crafty, and this time round we have a really easy theme - anything goes. We are luck enough to be sponsored this time round by Dew Drop Craftz. 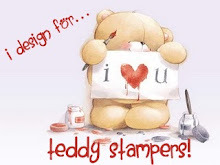 I have used one of the Adorables digi stamps from Sugar Nellie for my card, which has been coloured with ProMarkers. The DP is from Craft Creations, and the buttons are from my rather too large stash. Thanks for looking, and I'll be back soon. This is so sweet! I just love the soft yellows. Very beautiful card! Cute! Love the soft colours! Thank you for sharing with us at The Crafty Pad this week! What a beautiful card - that image is just stunning. beautiful card love that Sarah Kay image. love the coloring too.. thank you for sharing with us over at critter sketch challenge this week, good luck!! A beautiful card love the colours and Thanks for joining us at DCD. Oh I love this image, it reminds me of my youngest even though she is nowhere near this 'peaceful' lol. I love the color you have used and the LO is really nice as well. Thanks for playing with us this week at The Crafty Pad! A beautiful card Thanks for joining us at DCD. The Monthly Challenge at the Latte Lounge is "Cards for Mom and Other Special Women in Our Lives". We would LOVE for you to join us and enter your card in our challenge! We're having a drawing at the end of the month for all KINDS of great prizes!! If you're not already a member, we'd LOVE for you to join us!! this is stunning. You need to frame this. you truly are an artist.